On Monday 20th November 34 students who are studying Sociology attended the Criminology conference in Manchester. The day started with an introduction to criminology, where our students were able to show off some of their knowledge by answering questions posed by the speaker Bill Dixon, who remarked on how impressed he was with their knowledge on environmental crime. There was a range of speakers throughout the day with students hearing research on a range of topics such as domestic abuse, hate crime and islamophobia. In particular students enjoyed the session on the psychology of lie detection, where students had to put their detective skills to the test and figure out who was lying in the room- harder task than first thought! The day ended with a Q&A with a former prisoner who talked about their experiences of life behind bars, a highlight for many students who found his stories interesting and debate starting amongst students on the effectiveness of prison. 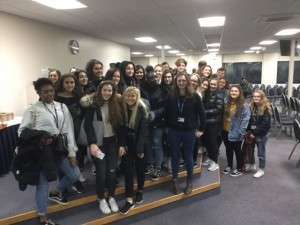 The day was a great opportunity to expand their knowledge of the subject in a lecture based environment and to raise questions about criminality. Well done to all students who attended!